Easy-to-integrate, easy-to-use. Sophisticated add-ons for library websites. Three new modules for library websites that deliver on efficiency and ease-of-use, without any limits on the amount of your data we hold, number of users, or log-in location. Built from the ground up with code that speaks to the latest generation of browsers, mobile devices, and social media, these modules provide an easy, intuitive interface for both site visitors and the staff who manage the presence of your library online. There’s no need for any complicated template work to make our sophisticated looking and acting modules appear as integrated parts of your site. The system is straightforward, with clear and consistent directions for both the patrons who use the modules on the front end of your site and the staff who manage the details at the backend. Our data—and yours—are hosted on secure servers with redundancy and auto-scaling to meet peak demand. A single, intuitive administration area attends to as many of our modules as you’re using, with real advantages when more than one are leased together—like the event calendar and room reservation modules which talk with each other to eliminate location and time conflicts. Staff maintaining the site are able to log in from any browser with an internet connection. The modules are responsive—content is always displayed correctly according to viewport dimensions, rather than by specific device. Each listing is search engine-optimized and uses Structured Data to improve the display of search results. Search and filter functions allow users of both the front and back ends to quickly locate what they’re looking for. And, we’re competitively priced! Our modules are delivered within the context of your pages—not on another website—so you retain full navigation, the look of your site, and an address that contains your domain name. They work on any platform: WordPress, Drupal, Joomla, and more. Plus, we provide tools to manage fonts and colors, allowing you to more closely match our modules with those of your site. Visitors will no longer be confused about exactly where they are when they access functionality delivered by your add-ons. We’ve figured out an easy way to enhance your productivity and help you stay on top of your budget at the same time: NO LIMITS on where staff may access our administration section. NO LIMITS on the amount of data you can have on our system at any one time. NO LIMITS on how many staff members may access the modules. And NO LIMITS on the number of branches you can have associated with your library’s account. The only limit is on what you get charged—the same, no matter what! Even if you’ve seen our modules on other library websites, you don‘t really know the half of it. What streamlines your workflow is the Dashboard, our administration section which provides a host of tools for managing the delivery and functioning of our modules. User accounts may be set up with different levels of access to assign ownership of specific areas while denying access to sections outside of their responsibility. Each of the modules is presented in the same consistent way, so getting up to speed on the system is quick. Reservations follow the same approach in each, though may be individually handled in different ways depending upon your needs—things like a waiting list option, auto and manual approval choices, an attendance list, and editable emails automatically send to registrants. Assets such as images and PDF files are easily uploaded to a common “library,” which can be accessed from within any module. A What’s Happening at the Library area provides a list of everything in the system that is taking place at the library, presented within a time range that you determine, providing some important details, and delivering links to records. A Location Utilization page provides a visual view of room usage in weekly increments. Reports collect the information you need to evaluate use and support budget requests. A system designed for libraries to manage the posting of events on their website and social media and handle the complete registration process for those events that require it. 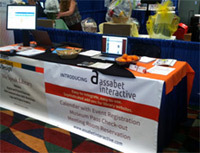 The Assabet Interactive online Event Calendar with Registration module delivers professional-looking listings to your library website and social media postings, as well as intuitive methods to manage the complete registration process, including the status of registrants. The Dashboard, our administration area, provides tools that allow you to manage your account, create and modify event records, and control every aspect of the registration process, including registrant lists, waiting lists, attendance, and automatically triggered emails. You can easily set up series and duplicate old records from the past as the basis of new events. Reports, created from data collected by the system—and unlimited in amount—may be generated to measure use and support budget requests. Our method for delivering the module enables you to retain full navigation and the look of your site, with URLs that contain your domain name. That—and a method for CSS experts to customize colors and fonts to more closely resemble the design of your site—means that visitors don’t feel like they’ve been sent to another location. The display of your calendars, event listing pop-ups and registration forms is responsive—always properly rendered, no matter what device they’re using to visit your site. 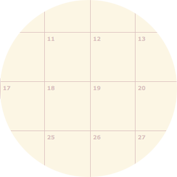 The calendar may be seen in both monthly and serial views, with filters and a search field for quickly locating events. In addition, there is an upcoming event feed that delivers a condensed presentation on the home and other pages. 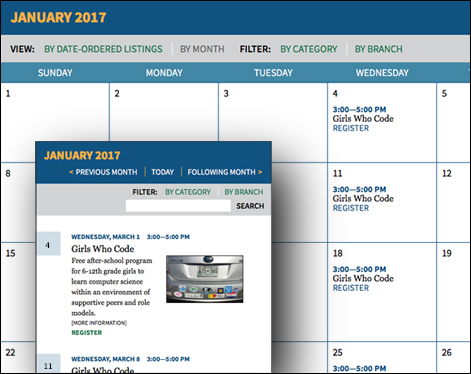 There are also ways of filtering the calendar for display on category-specific pages, like your children’s section page. No matter the display format, each calendar listing is connected through a single click to a pop-up box containing a featured image and details about the event. If registration is required, a form will appear just below the text in the same box; providing information in the requested fields, then submitting, will initiate the registration process. Automatically triggered emails inform the patron the status of the registration, including—but not limited to—approval, denial, pending, waiting list, and a reminder sent one, two, or three days before the event. Event listings are easy to create and publish—as single events or as a series, with the possibility of assigning registration to each instance of the event or to the first. A host of options help you manage registration: capping the number of attendees, auto or manual approval, waiting lists, attendance check, custom fields, registration period definition, and the ability to create and send emails to individuals or groups connected to a particular event. Posting to popular social media platforms is a single click away. Time and location conflicts are automatically identified with any other events in the system. And a “snapshot” of all events taking place in the library during a date range you define helps with the big picture. In addition, a visual representation of location use in the library helps you quickly evaluate room availability. Like these. A clean look that that can be adjusted to visually integrate into your site’s design. An intuitive user interface—both for site visitors and the staff who maintain the site. Features based on conversations with and requests from librarians. No limits on the number of users, the amount of data kept on the system, and from what IP address staff must access the system. Newly developed, with code that speaks to the latest generation of browsers, mobile devices, and social media. Reports on attendance and room use. And, we’re competitively priced. Isn’t that worth a free look? A system designed for libraries to manage the online reservation of museum passes and the check-out and return of passes at the library. The Assabet Interactive online Museum Pass Reservation system delivers professional-looking listings to your library web site and employs easy methods for both patron and staff to successfully participate in the reservation process. Assabet Interactive provides a listing for each museum that includes a unique icon based on the institution’s identity, an original summary of the institution’s features, contact information, and links to both directions and the institution’s website. Additions by staff about type of pass, pick-up location, privileges, and exception dates complete the listing. During the online reservation process, patrons have the option to search by date or by museum, including filtering the results of the latter by type of institution for quick searches. Administrators log in through a browser from any location with internet access. From the Assabet Interactive Dashboard, staff can manage their account, create and modify museum pass records, generate reports, and control every aspect of the reservation process. A scanner interface allows for the easy acquisition of bar code information from museum passes and library cards to manage reservation and pickup. The museum pass module’s responsive design ensures that it is always properly rendered, no matter the device used to access your site, and is delivered in such a way that patrons remain on your site, retaining the look and feel of the design and preserving full navigation. In addition, color and fonts may be adjusted to better match the look of a library’s website. 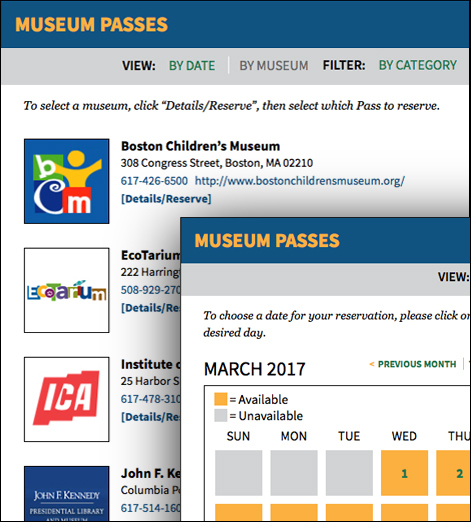 Assabet Interactive’s Two Views of the Museum Pass module: Portions of the by-museum and by-date views, either one of which patrons may choose to begin the reservation process. Patrons can choose to initiate the pass selection process by date of visit, or by museum, narrowing their search if they wish by using the categories filter. Clicking on the Details/Reserve button below each listing reveals information about the institution and use of the specific pass at your library, with a button to initiate the reservation process. Providing the solicited information in the form and agreeing to the terms and conditions will enter the request into the system. Automatically triggered emails triggered by “events” inform the patron the status of the reservation, including—but not limited to—approval, denial, pending, and a reminder sent before the pass is scheduled for use. Reservations can be auto-approved or held for manual review. Library card validation is available, and the bar codes of library cards and/or passes may be captured if used in conjunction with a hand-held scanner during pass pickup or return. Reservation records make it easy to view usage and communicate with patrons. Like these. A clean look that that can be adjusted to visually integrate into your site’s design. An intuitive user interface—both for site visitors and the staff who maintain the site. Features based on conversations with and requests from librarians. No limits on the number of users, the amount of data kept on the system, and from what IP address staff must access the system. Newly developed, with code that speaks to the latest generation of browsers, mobile devices, and social media. Reports on museum pass use and pass subscription renewal dates. And, we’re competitively priced. Isn’t that worth a free look? A system designed for libraries to manage room booking requests on their website, including tools for handling images, terms and conditions documents, and equipment assignments. The Assabet Interactive online Meeting and Study Room Booking module provides a way to streamline room requests at your institution—from the clear presentation of room information and equipment availability to easy form submission by patrons and processing by staff via your library website. It delivers automatically triggered emails at important points, the ability to assign equipment to specific rooms, and a method for agreeing to a terms and conditions document delivered throughout the reservation process. Though not a requirement, using the Assabet Interactive Event Calendar system in tandem with this module provides a number of advantages, such as the ability to list a meeting on the public calendar and quickly identify conflicts with rooms already booked for other events. The room booking module’s responsive design ensures that it is always properly rendered, no matter the device used to access your site. The module is delivered in such a way that patrons remain on your site, while your site’s navigation is preserved. In addition, color and fonts may be adjusted to better match the look of a library’s website. 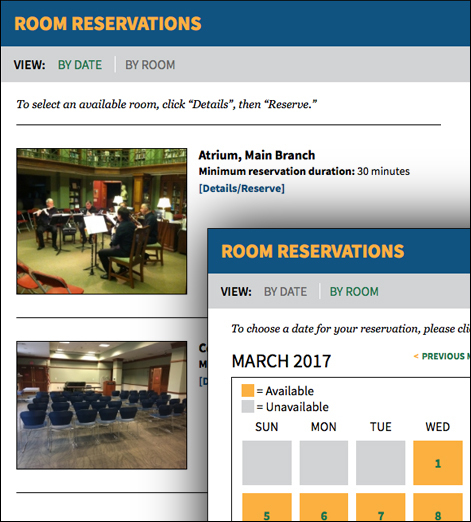 Assabet Interactive’s Two Views of the Meeting and Study Room Booking Module: Portions of the by-room and by-date views, either one of which patrons may choose to begin the booking process. 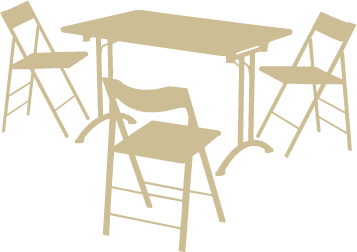 Patrons can choose to initiate the pass selection process by date of need, or by the specific room. After providing requested information in an online form and agreeing to the terms and conditions, a patron’s request is entered into the system. Automatically triggered emails are triggered by “events” that inform the patron the status of the reservation, including—but not limited to—approval, denial, pending, and a reminder sent before the room is scheduled for use. Accessing the administration system is easy—you log in through a browser from any location with access to the internet. The Dashboard, Assabet Interactive’s administration section, delivers tools that allows you to manage your account, create and modify room and equipment records, and control every aspect of the request process, including communication by email with requesters. Room listings are created by providing the requested information, an image, and the terms and conditions document that all room users must agree to. Equipment may be added to the system and assigned to various rooms. Once added to the system, a listing is only displayed as an option according to when you’ve made the room available and when the space has already been booked. Reservations can be auto-approved or held for manual review. Reservation records make it easy to view usage and communicate with patrons. Unique email messages may be easily composed and sent to those booking a room, and all automatically triggered emails may be edited to better reflect the reality at your library, or even turned off as an option. Like these. A clean look that that can be adjusted to visually integrate into your site’s design. An intuitive user interface—both for site visitors and the staff who maintain the site. Features based on conversations with and requests from librarians. No limits on the number of users, the amount of data kept on the system, and from what IP address staff must access the system. Newly developed, with code that speaks to the latest generation of browsers, mobile devices, and social media. Reports on pass usage and subscription start and end dates. And, we’re competitively priced. Isn’t that worth a free look? That would be the “TLA” conference in Austin! Looking for software for library websites that solves problems instead of creating them? Visit us at booth 3016 on April 15, 16, and 17 and get a good view of a new online event calendar that includes a robust registration component. We&apos;ve also got room booking software that works hand–in–glove with the calendar, so you can manage all of the spaces within your library without creating conflicts—unless you want to, of course. See you there. That’s where we’re headed! See what Assabet is made of at library conferences in Illinois, Rhode Island, and New York this fall. That’s ILA (Oct. 10–11), NELA (Oct. 22–23), and NYLA (Nov. 8–9). We’ll also show you some new enhancements, and the stuff that’s made our software the solution of choice for lots of public libraries. The city covers 25 square miles, but we’ll only be taking up a tiny part of that at table 24 in the vendor hall. Despite that, we cover a lot of ground with our modules for library websites. Stop by to chat, see how our software can help you do your job, and grab a clementine on your way to a session. See you there. We’ll be in Burlington at the NELA Conference in Burlington October 22 and 23, 2017 to show you how our easy-to-use software for websites is a lifeline for libraries that feel like they need some help to stay afloat. Visit us at table 500 in the exhibition hall for demos, clementines, and advice on how to put the wind in your sails. Look for the clementines at the 2017 MLA conference on the Cape. They’ll be right next to a couple of guys giving a demo of Assabet Interactive’s sophisticated tools for library websites. When you’re there, ask about our conference discount. That’s a discount on the software—the clementines are free. Sweet! See you there. AI: Artificial intelligence or Assabet Interactive? Visit our table in the Vendor’s Hall in Portsmouth, NH, and see just how smart our software is. And don’t forget to ask about our conference discount. See you there. Publish events to Social Media in a snap. Forget the copy, paste, repeat approach. And you can ditch the sharing application from another vendor. One step is all it takes to post any event from your Assabet Interactive website calendar with all the information pre-populated. Can we show you how easy it is? Get in touch with us now for a free demo. We’re taking to the streets to walk librarians through our new software for library websites. We’ve created a smarter way of delivering museum pass reservations, meeting and study room reservations, and an event calendar with registration—and we want to show you the results of a couple of years of development. Contact us for a demo of our new modules, all built from the ground up—no patches, no old clip art, no convoluted ways of doing things. Email us now for a demo. Hosted within a high-availability environment on secure servers. All three of our modules are delivered to you from secure and dependable servers strategically located in different geographic availability zones, providing yet another layer of reliability with redundancy and auto-scaling to meet peak demand. What, did you think we were in a garage? Taking orders at the 2016 NELA Annual Conference! A better choice has now arrived. We will be launching our products at this year’s NELA meeting on October 17 and 18. Stop by table #705, and we’ll give you all the details. You don’t need to wait anymore for a conference or meeting to see a demo of the visitor experience of two of our modules. Just visit the Goodnow Library’s site and you’ll see the difference. Stop by table #705 at NELA this year, and we’ll show you the administration sections of those add-ons, as well as provide you with a good look at our new Museum Pass module. Mark your calendars—and ours! Stop by our table in Hyannis on May 17 or 18, and let us show you how our new Event Calendar and Room Reservation modules are meeting the needs of a real library. Going beta to make things even bettah. (What can we say—we live in Massachusetts!) Coming into the home stretch now with a release of our three modules on a public library site. That means that soon you’ll be able to add them to your own library site. We’ll keep you posted. Visit us at table #309 at NELA. Assabet Interactive will be showing demos of our new add-ons for library websites—both the public and administration sections—at the New England Library Association meeting in late October in Manchester, NH. Stop by, and we’ll show you how our new approach works. Introducing Assabet Interactive. Assabet Interactive will be unveiling early demos of our add-ons for library websites at the MLA Conference in Worcester, MA. Come and see our approach. We believe that add-ons for library websites should be easy to install and maintain, appear as an integral part of your website, and take advantage of current technology as it becomes available. Our intuitive tools were developed because of the need to better deliver services to patrons online and easily manage some of the more detail-oriented tasks associated with events, museum visits and meeting room reservation. And, equally important is the fact that they all appear as a visually consistent part of your website. Started by a designer and a programmer, Assabet Interactive is focused on the positive experience of two important groups: the patrons who visit a site and the librarians who manage it. This approach is based on the unique marriage of design and technology the two principals bring to the table. We’ve been close collaborators for over ten years. Robert Levers is an award-winning designer with a background in advertising. He has lent his expertise to a wide range of projects, including the Goodnow Library in Sudbury, the Concord Free Public Library, and the Harvard University Libraries and Archives, all in Massachusetts. He has also done work for Massachusetts General Hospital, the Concord Museum, and departments and centers at Harvard, MIT, Radcliffe, Wellesley College, and Princeton—everything from the development of websites, design of exhibitions, and creation of collateral materials, ads and presentations. Jonathan Tegg has been a developer for over 15 years, using his skills and knowledge on a large variety of projects to bring conceptual designs to life through code. Jonathan has worked for healthcare providers, libraries, museums, universities, non-profits, and corporations, and delivered practical and functional solutions using a standards-based approach to development. He has provided the technical foundation for many of his partner’s projects, as well as for clients such as Philips, Handel & Haydn Society, and Partners Healthcare.